Vancouver's Veronika Noize joins best-selling authors Jay Conrad Levinson, and Robert Bly in a new book on marketing! SEVIERVILLE, TN - Vancouver, WA-based Veronika Noize, ranked as Google's #1 marketing coach in the USA, has been selected from a nationwide search to be featured in the 1st Edition of Marketing Strategies that Really Work, a highly successful book series from Insight Publishing. 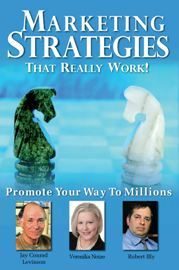 Featured on the cover between best-selling authors Jay Conrad Levinson (author of the Guerrilla Marketing series, the most successful marketing series of all time), and Robert Bly (author of The Complete Idiot's Guide to Direct Marketing, among other books), Noize has contributed a chapter outlining her unique and powerful personal networking system strategy. Noize is joined by several other well-known authors and speakers, each offering time-tested but often surprising strategies for marketing success in frank and intimate interviews. "Do you want to know the secrets of some of the sharpest marketing minds in business? Sharpen your pencil and get out your note pad! You're going to want to take notes when you dig into this collection of inspiring interviews," says Noize. Veronika (Ronnie) Noize, known world-wide as the Marketing Coach, is the author of the best-selling ebook How to Create a Killer Elevator Speech, and the creator of The 30-Minute Networking Secret Complete Toolkit, as well as a contributing author of Marketing Strategies that Work from Insight Publications. As a marketing executive for over 10 years, Noize launched more than 200 consumer products, including software, books, comics, CDs, toys, and games, generating more than $650 million dollars through sales and licensing for properties such as Star Wars and The X-Files, among others. In 2004 she founded the Northwest Women's Virtual Business Network (NWWVBN), a virtual space where businesswomen in the Portland, OR/Vancouver, WA area can network and connect with others. With over 500 active members, the NWWVBN is one of the largest women's groups in the region. Voted the 2007 Coach of the Year by her chapter of the International Coach Federation, and named one of the area's 100 most influential women by the NW Women's Journal, Noize is a dynamic speaker and sought-after marketing expert with an international clientele who helps small office/home office (SoHo) businesses attract more clients through her presentations, products and programs. In addition to her busy speaking and coaching practice, Noize is also a trainer for the International Coach Academy, an accredited coach training school in Australia, and an active member of several business and philanthropic groups in the Vancouver, Washington area.